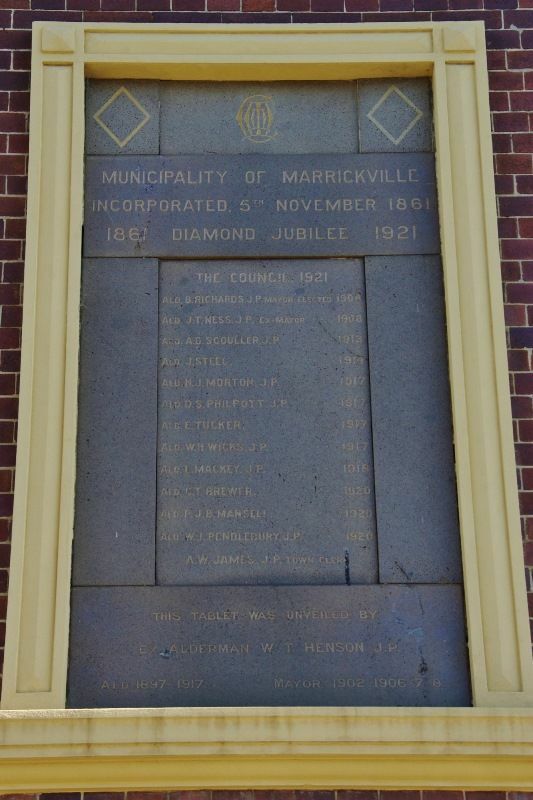 A tablet commemorates the Diamond Jubilee of the Marrickville Municipality in 1921. 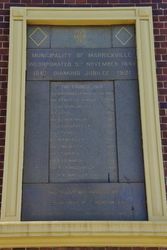 The tablet was unveiled in 1922 at the official opening of the new town hall. With a gay procession of scouts, cadets, tradesmen's vehicles, bands, decorated cars, lodge members, and imitation aborigines, Marrickville yesterday commenced its Jubilee week. The new Town Hall was officially opened. 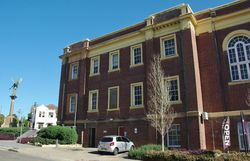 It is a roomy, well-designed, artistically decorated brick and stone structure at the intersection of Marrickville and Petersham roads. Crowds of residents lined the procession route from Enmore Park, enjoyed it, and cheered it, and then packed into the space in front of the new domicile of the municipality's aldermen to witness the official opening. The proceedings were commenced with the National Anthem and the sounding of the Last Post by a boy scout, after which Lieutenant H.T. Seymour, with the assistance of Lieutenant J. Maxwell, V.C., M.C., and bar, D.C.M., unveiled the gun captured by the 3rd Battalion and 1st and 4th Divisions on the Hindenburg outpost line. The diamond jubilee commemoration tablet on the eastern wall of the building was unveiled by ex-Alderman W. T. Henson, who was an alderman in the council from 1897 to 1917, and does not look any the worse for it. In addition, Alderman Henson was four times elected Mayor. Sun (Sydney), 12 February 1922. Ex Alderman W.T. Henson J.P.